The Trust for Public Land creates and protects places people in Oregon care about—from downtown parks and playgrounds to spectacular backcountry natural areas. Our work is concentrated in three regions: around metro Portland, where we are helping to create a system of parks, trails, and natural areas; in central Oregon, where we are working to map, prioritize, and protect irreplaceable river and forest lands; and in the Willamette Valley, where we are partnering with local agencies to give people better access to surrounding nature. Which U.S. city is top dog for dog parks? In early 2000s, Deschutes County was one of the most rapidly growing counties in the state. Beautiful scenery, accessible recreation, and abundant wildlife attracted people and business, transforming the local economy, and threatening the very qualities newcomers found so attractive. Cherry Park, a beautiful and popular local park in a densely populated, park-poor suburb of the City of Portland was until only a few years ago, an old quarry site. n June of 1997, TPL was able to convey to the Nez Perce tribe some 10,300 acres in the heart of its ancestral homeland in Northeast Oregon. In 2007, 27 acres on Clatsop Butte in Southeast Portland were slated for a housing subdivision, but when the housing market took a downturn in early 2010, TPL had a chance to purchase and protect the property as city parkland. The Trust for Public Land is working with Portland Parks and Recreation to focus on densely populated areas that most need new parks—places like the Cully neighborhood, which has the city’s lowest number of parks per capital. The Trust for Public Land helped protect a 360-acre wetlands site on Crystal Creek, a spring creek tributary to Upper Klamath Lake in southern Oregon. The Trust for Public Land helped protect three parcels of land for the city of Depoe Bay, Oregon, for use as a municipal waterfront park. In 2008, The Trust for Public Land, in partnership with Deschutes Land Trust, city administrators and local Parks and Recreation departments throughout the county undertook to create a comprehensive plan—or greenprint—of Deschutes County. The Trust for Public Land worked with many partners to successfully protect The Deschutes Wildlife Area is a vast, inspiring, and beautiful landscape on the lower Deschutes River in Central Oregon. This new 290-acre state natural area at Hayden Island on the Willamette River is a fitting tribute to the late Gail Achterman, an Oregon conservation leader passionately committed to creating an economically and ecologically sustainable future for the Willamette Basin. In 2000, Portland Parks & Recreation asked TPL to help acquire Holly Farm, a 1.7-acre property, named for the holly trees that grow there. Located where the Kilchis River joins Tillamook Bay, Kilchis Point is named for a respected leader of the Tillamook people. Located at the confluence of the Klickitat and Columbia Rivers, Lyle Point is a sacred site to the Confederated Tribes and Bands of the Yakama Nation. 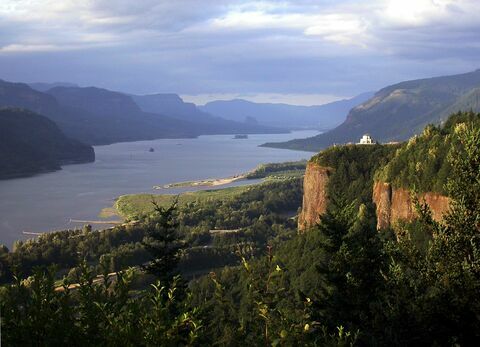 In September 2010, The Trust for Public Land transferred ownership of Chehalem Ridge to Metro. The property is now being restored as the new Chehalem Ridge Natural Area. A symbol of Bend's history, Miller's Landing was the original lumberyard for the Brooks-Scanlon mill. It was protected in 2010 and will be integrated into the community park river system as part of the popular Deschutes River Trail. The City of Beaverton, Metro, THPRD and TPL all worked to fund the purchase of the Murray Ridge property, which was transferred into the city's ownership in January 2010.
drinking water and fish and wildlife habitat. This former private golf course was slated for development of 250 homes and apartments, but TPL helped secure the property and generate funds for it purchase for a park. The Trust for Public Land stepped in to prevent this popular dog park from being sold to developers while the city's dog park community mobilized support for a $17 million park bond measure. 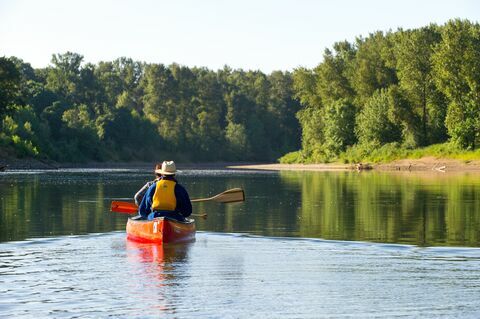 The Trust for Public Land helped preserve 51 acres for the Statyon Community Park along the North Santiam River in the Willamette Valley in Oregon. The successful conclusion of the Summer Creek project in 2010 is a testament to The Trust for Public Land's tenacity and commitment, both in fund-raising and sensitive negotiations. opportunities for residents to connect with nature. People can hike, bike and explore land rich in wildlife from Thurston to Jasper-Natron. When complete, the effort will provide 660 acres of parkland, including an 80-acre community forest. The Trust for Public Land worked for over two years to protect Whalen Island, one of the most pristine and easily accessible properties on the Oregon Coast, for management by the Oregon Department of Parks and Recreation. 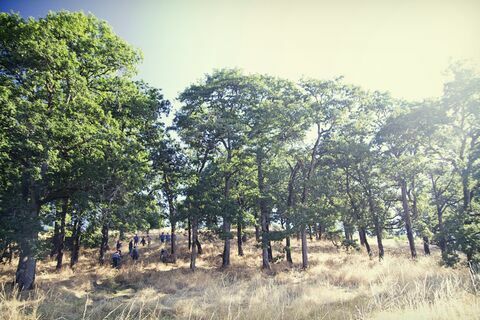 The oak savannas found in Oregon's Portland Metro region were created by native peoples using fire as a management tool. The Trust for Public Land worked to save 14 acres of this rare and beautiful woodland to create the White Oak Savanna nature park. Norman Yeon purchased 110 acres at Sunset Beach on the Oregon coast in 1962. He left it to The Trust for Public Land when he died, ensuring that it would remain protected and open to the public forever. Best-selling Western author Zane Grey built a one-room cabin on the Rogue River in southern Oregon 1926. When the land and cabin were offered for conservation a few years ago, TPL worked to acquire them for permanent protection, completing the project in March 2008. TPL continues to work with Willamette Valley landowners to further extend the protected land in this beautiful region of Oregon's working lands only 8 miles northwest of Salem. Working from more than 30 offices nationwide, The Trust for Public Land helps communities raise funds, conduct research and planning, acquire and protect land, and design and renovate parks, playgrounds, trails, and gardens. The Trust for Public Land is an IRS approved 501(c)(3) tax-exempt organization. All donations are tax deductible to the extent provided by law. Our Federal Identification Number (EIN) is 23-7222333.